THE locals of the tiny western Victorian village of Moyston are wondering why if they've been virtually forgotten in this the 150th year of Australian Rules football, even though it was in a paddock close to here that local Aboriginal children played a game destined to become the nation's Number One football code. For they say many officials of today's game appear to have overlooked the role of these children and the game they called 'marngrook' that had them running, kicking and catching a ball made of a possum hide stuffed with feathers or charcoal. The only white fella amongst the rough and tumble of those early games in the dust of the Wimmera, was a chap named Tom Wills: he spoke the local language, played their Aboriginal games with them on his father's cattle property called Lexington, and whilst he gets a few mentions in AFL circles, his role and that of his playmates appears today to have been largely ignored. And this is despite the fact that Wills went on to join a committee that drew up the first rules of The Melbourne Football Club at a meeting in East Melbourne's Parade Hotel in May 1859, and to play for Melbourne and then Geelong, captaining both fledgling teams in 1859 and 1860 respectively. And on one early occasion, with a lack of players and officials, he both played and umpired in the one match. By October 1896 the Victorian Football League had been formed with eight teams on its books: Carlton, Collingwood, Essendon, Fitzroy, Geelong, Melbourne, South Melbourne and St Kilda; within four years this had grown to twelve teams – often made up of first grade cricketers who used VFL to keep fit in winter – and in 1982 the South Melbourne Football Club relocated to Sydney to become the Sydney Swans. By the late 1990s the game had spread nationally with teams in all mainland States and the name was changed from the Victorian Football League to the Australian Football League. Which is why the townsfolk of Moyston had been expecting big things in this the year of AFL's 150th anniversary, with local songwriters putting words to music about Tom Wills and his town, and historians dusting off records of how the game has grown from the dust and the sounds of happy kids booting a rag-tag ball between the Moyston gum trees in those far-off days. 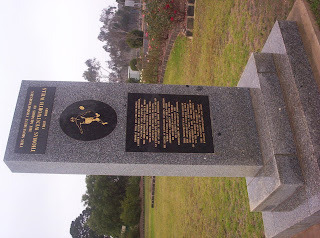 Sadly such recognition appears not to be on the horizon, even though most of the thousands of tourists who've passed through Moyston have stopped to pay homage to the game that was born here in the shadows of the Grampians. 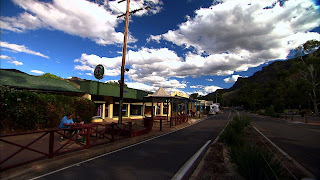 But it's not been all muscle and testosterone that have helped the survival of this town: there's a small but growing cultural community of writers, poets and artists who have settled in the foothills of the local national park and display and sell their works in the town's only store and a number of galleries and studios. There's also been a general increase in the local population, with the draw-card a lower cost of living, a quality country life-style and a close proximity to the larger towns of Stawell and Ararat, the latter just 15 kilometres away. 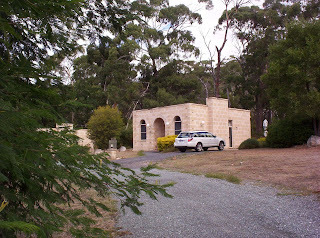 Moyston is a cute little place with a smattering of houses, hobby farms and larger commercial holdings, a bluestone church, a general store, a couple of B&B's, and a collection of boutique wineries scattered amid the surrounding countryside. Go visit, have a picnic on the grounds of the local football club, stroll through the rose gardens that are home to the memorial to Tom Wills and his Aboriginal mates, have a chat with the locals – and then drop a note to the AFL and reprimand them for ignoring this important little slice of their game's history. After all it was Moyston that gave us 'footy,' which in 150 years has not just spread its wings Australia-wide, but has gone international and is now played in Canada, Japan and New Zealand. B&B accommodation includes Grochan Country Retreat Tel : (03) 5352 4797, and accommodation options in nearby Halls Gap range from backpacker facilities to the five-star Marwood Retreat.
. MEMORIAL to Tom Wills and his Aboriginal mates who used a stuffed possum hide ball to play 'marngrook,' the forerunner to today's AFL.
. RETREAT to the bush – part of the 5-star Marwood Retreat snuggled in the leafy Grampians.
. SLEEPY town: tiny Moyston is home to an active cultural community.